Celeriac - there are many ways to cook this ugly, but totally delicious vegetable, so go on, give it a chance. We think you'll be back for more. And if you've got a tasty recipe you want to share, get in touch - we'd love to try it out. 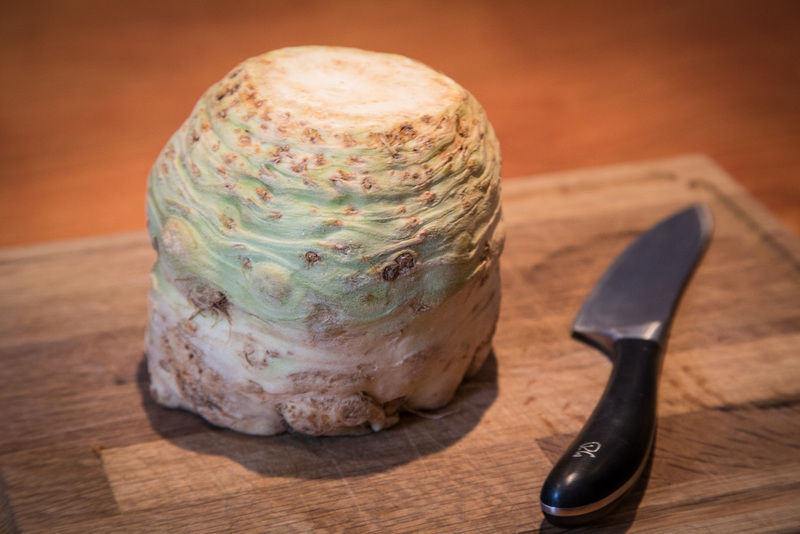 The best way to peel celeriac is to use a sharp knife and be a bit ruthless. Slice off the top followed by the knobbly bits, they all need removing, then place it firmly on the chopping board and slice down on all sides to remove the skin. You can do this with a potato peeler if you prefer less waste but it is more time consuming. Grill bacon under a medium grill for 10mins. And then slice into thin strips. Interleave the potato and celeriac with a 1/3rd of the grated cheese in an ovenproof dish. Lay most of the bacon on top (reserve some for garnishing) and pour over the cream. Sprinkle the rest of the cheese on top with the rosemary. Place in the centre of a pre-heated oven, uncovered, for 40mins. At 160oC/320oF/Gas Mark 3. Garnish with the reserved strips of bacon. Prepare the celeriac then cut into chunky chips. Put into plastic bag and pour in 1-2 tbsps olive oil and curry powder then shake the bag well to combine the ingredients. Pour into a roasting tin; add a generous knob of butter. Roast in a hot oven at 220C-240C for about 30-40mins. Add salt and pepper to taste. Delicious! Alternatively, you can exchange the curry powder for paprika or cook them plain - just add salt. Prepare the celeriac and coarsely grate either by hand or in a processor. Blanch the shreds in boiling salted water for about 1 min, drain and refresh in cold water. Drain well. Mix all the other ingredients together in a large bowl and season well. Add the celeriac, toss and serve. This will keep in the fridge for up to 12 hrs. Preheat the oven to 180C. Place the celeriac wedges into a large bowl, drizzle with a little oil and stir to coat them. Smear the butter thickly around an ovenproof dish, just large enough to take the celeriac wedges lying down flat. Lay the celeriac in the dish, season with salt and pepper and pour over the marsala. Transfer to the oven and roast for about an hour, turning the wedges and basting every now and then, until richly browned all over and very tender. You may need to add a little water towards the end of the cooking tie to prevent burning. Serve warm. Melt the butter in a deep saucepan. Add the onions and fry them over a high heat for about 5-10 mins. Add the garlic, then sprinkle in the flour and curry powder. Stir in the stock and bring to the boil. Add the celeriac, cover and simmer for about 20-30 mins until tender. Put the soup into a food processor and liquidize until smooth. Return to the pan and bring to the boil. Season with salt and pepper and stir in half the cream. Pour into bowls and swirl a little of the remaining cream on top. Preheat oven to 240C. You also need a large solid baking tray. First scrub parsnips and carrots, dry them well and place them in a large bowl with all the other prepared vegetables. Now add the crushed garlic, olive oil and mixed herbs, then, using your hands, mix well to make sure they all have a good coating of the oil. Arrange them on the baking tray, season and cook in the oven on a high shelf for 35-40 mins until they are cooked through. Prepare the celeriac as before and peel the potatoes. Cut into even pieces and place into large saucepan, cover with water and add salt. Bring to the boil and cook until soft. Drain, add the butter and crème fraiche then mash together and season well. This is so much nicer than just plain mashed potatoes.